The alternative fuel's CI value is divided by its Energy Economy Ratio (EER) in order to obtain the EER-adjusted CI value, representing the emissions which occur from the use of alternative fuel per MJ of conventional fuel displaced. 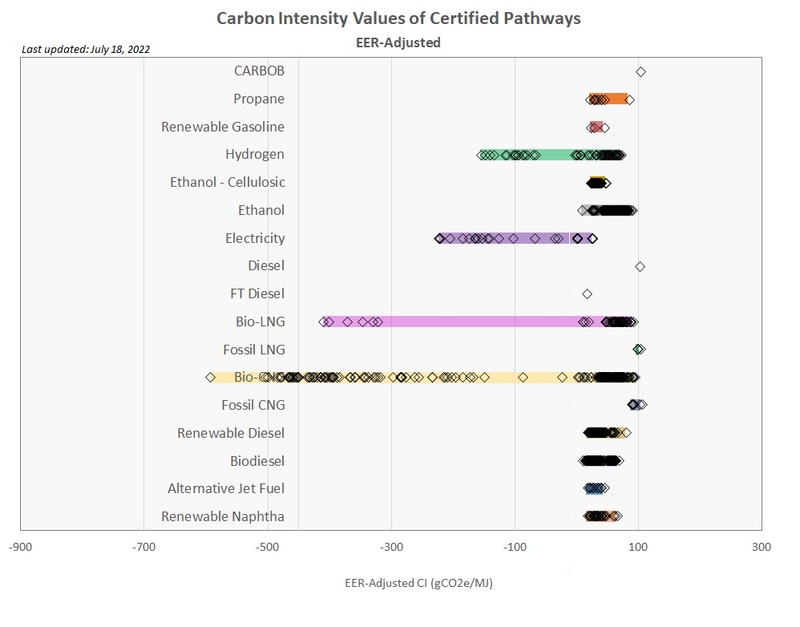 Each marker represents an individual certified fuel pathway carbon intensity (CI), adjusted by the Energy Economy Ratio (EER). The lent of each bar indicates the range of carbon intensity that may be achieved by a fuel pathway. The wide range of carbon intensities is due to the lifecycle emissions methodology of the LCFS, variations in feedstock types, origin, raw material production processing efficiencies, and transportation all contribute to an individual producer’s fuel pathway CI. All valid CI values shown here are certified including the legacy, Tier 1, Tier 2, and the Lookup Table. In keeping with section 95488 of the Low Carbon Fuel Standard (LCFS) Regulation, this website provides a list of all fuel pathways with their respective certified carbon intensities (CI). This website lists CIs for all legacy fuel pathways (including recertification of CA GREET 1.8b pathways) as well as CIs of Tier 1 and Tier 2 fuel pathways. These pathways are available for use by fuel producers, regulated parties, and other entities. In addition, section 95488 (c)(4) of the LCFS Regulation requires Tier 2 applications to be posted for public comments before they can be certified by the Air Resources Board (ARB) Executive Officer. Such pathways will be posted here for public comments for a period of ten business days. At the end of the comment period, staff will review posted comments and if deemed substantive, request a formal response from the applicant. If the response from the applicant is deemed adequate, staff will recommend certifying the pathway. If deemed inadequate, the pathway application will be denied and the applicant may submit a new application for future consideration. Public comments, applicant responses, and staff recommendations will be available on this website. The list below is searchable and sortable by feedstock, fuel, tiers, and facility name of your choice. Input the known App#, Class (such as Legacy, Tier 1, Tier 2, Lookup Table), Facility Name, Facility Location, Fuel Type, and Feedstock to show all relevant pathways (Multiple selections can be made at the same time Ex. Sorghum Ethanol). Fuel Producer: Copersucar (3702); Facility Name: Usina Santa Lúcia (70426); Brazilian sugarcane juice-to-ethanol pathway, with credit for mechanized harvesting. Fuel Producer: Copersucar (3702); Facility Name: Usina Barra Grande de Lençóis S.A. (70412); Brazilian sugarcane molases-to-ethanol, with credit for mechanized harvesting. Fuel Producer: Copersucar (3702); Facility Name: Açucareira Quatá S.A. (70406); Brazilian sugarcane juice-to-ethanol, with credit for mechanized harvesting. Fuel Producer: Copersucar (3702); Facility Name: Açucareira Quatá S.A. (70406); Brazilian sugarcane molasses-to-ethanol, with credit for mechanized harvesting. Fuel Producer: Copersucar (3702); Facility Name: Usina Cerradão Ltda (70425); Brazilian sugarcane juice-to-ethanol, with credit for mechanized harvesting. Fuel Producer: Copersucar (3702); Facility Name: Usina Cerradão Ltda (70425); Brazilian sugarcane molasses-to-ethanol, with credit for mechanized harvesting. Fuel Producer: Copersucar (3702); Facility Name: Açúcareira Zillo Lorenzetti S.A. (70432); Brazilian sugarcane juice-to-ethanol, with credit for mechanized harvesting. Fuel Producer: Copersucar (3702); Facility Name: Açúcareira Zillo Lorenzetti S.A. (70432); Brazilian sugarcane molasses-to-ethanol, with credit for mechanized harvesting. Fuel Producer: BUNGE ACUCAR E BIOENERGIA LTDA (3858) ; Facility Name: USINA OUROESTE AÇÚCAR E ÁLCOOL LTDA (70483); Brazilian sugarcane molasses-to-ethanol, with credit for electricity co-product export, and mechanized harvesting. Fuel Producer: BUNGE ACUCAR E BIOENERGIA LTDA (3858) ; Facility Name: USINA FRUTAL AÇÚCAR E ÁLCOOL (70579); Brazilian sugarcane molasses-based ethanol, with credit for electricity co-product export, and mechanized harvesting. Fuel Producer: BUNGE ACUCAR E BIOENERGIA LTDA (3858) ; Facility Name: BUNGE ACUCAR E BIOENERGIA LTDA (3858) ; Brazilian sugarcane molasses-based ethanol, with credit for electricity co-product export, and mechanized harvesting. Fuel Producer: BIOSEV S.A. (3869); Facility Name: Usina Cresciumal (71068); Brazilian sugarcane juice-to-ethanol, with credit for mechanized harvesting, and surplus cogenerated electricity export. Fuel Producer: BIOSEV S.A. (3869); Facility Name: Usina Santa Elisa (71070); Brazilian sugarcane juice-based ethanol, with credit for electricity co-product export, and mechanized harvesting. Fuel Producer: BIOSEV S.A. (3869); Facility Name: Usina Vale do Rosário (70440); Brazilian sugarcane juice-based ethanol, with credit for electricity co-product export, and mechanized harvesting. Fuel Producer: Raízen Energia S/A (3805); Facility Name: Araraquara (71055); Brazilian sugarcane juice-to-ethanol, with credit for surplus cogenerated electricity exports, and mechanized harvesting. Fuel Producer: Raízen Energia S/A (3805); Facility Name: Araraquara (71055); Brazilian sugarcane molasses-to-ethanol, with credit for mechanized harvesting. Fuel Producer: 3 Phases Renewables Inc. (P306) ; Facility Name: 3PR (P1225): Solar-based (Photovoltaic) Electricity for a Single Dual Port Electric Vehicle Charging Station. Fuel Producer: Raízen Energia S/A (3805) Facility Name: Rafard (70557): Raizen Energia S.A., Rafard Mill: Brazilian sugarcane molasses-based ethanol, with credit for electricity co-product export, and mechanized harvesting. Fuel Producer: Raízen Energia S/A (3805) Facility Name: Costa Pinto (70552): Raizen Energia S.A., COPI: Brazilian sugarcane molasses-based ethanol, with credit for electricity co-product export, and mechanized harvesting. Fuel Producer: Raízen Energia S/A (3805) Facility Name: Paraguaçu (71057): Raizen Energia S.A., Paraguacu Mill, Sao Paulo, Brazil: Brazilian sugarcane molasses-to-ethanol, with credit for mechanized harvesting. Fuel Producer: Ag Processing Inc (4552) ; Facility Name: AGP Methyl Ester (St Joseph) (81732); Biodiesel produced from Soybean Oil (self-extraction) in St. Joseph, Missouri and transported by rail to California. Fuel Producer: Ag Processing Inc (4552) ; Facility Name: Ag Processing Inc - Sgt. Bluff (81733); Biodiesel produced from Soybean Oil in Sergeant Bluff, Iowa (self-extraction) and transported by rail to California. Fuel Producer: Solfuels USA LLC (S357) ; Facility Name: Solfuels USA LLC (82892); Biodiesel produced from Soybean Oil in Helena, Arkansas; Soybean extracted in the Midwest; Fuel transported by rail to California (Provisional). Downloadable version of Current Lookup Table, Tier 1, Tier 2, and Legacy Fuel Pathway Table, Current Pathways . To view the temporary pathway CIs, please see the Temporary Pathway Table.